Widely adaptable. Best in a moist soil. Tolerates wetness. Wild flower gardens. Back of the border. Good for late season color and cutting. Cut back early to mid summer for shorter plants. Divide at 2 to 3 years. 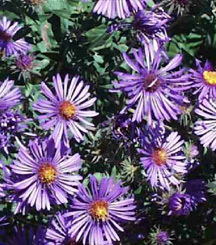 The New England Aster is a native species that occurs naturally throughout all of northeastern and north central United States - it is hardly limited to New England. It is perhaps the showiest of the wild asters and a parent of many of the garden cultivars available today. Asters can be used toward the back of mixed borders or in wildflower gardens. The fall flowers are a welcome addition when many other plants have finished blooming. They also make a nice cut flower, though the blooms may close in the evening. where the soil is likely to get very warm. Plants should be divided every 3 years or so. This can be done either in the spring or after flowering in the fall. Older woody portions should be discarded. For bushier plants, pinch back top growth in June.